Venture south of Mort'ton to Burgh de Rott, and help the Myreque move their base of operations to safety from Vanstrom Klause. After the attack on the Myreque by Vanstrom Klause - and with the deaths of both Sani and Harold - Veliaf is counting on you to help. Now that the Myreque freedom fighters' base camp has been revealed, they'll need to move on and set up base somewhere else. Veliaf has heard of a little-known village south of Mort'ton, referred to as 'Burgh de Rott'. 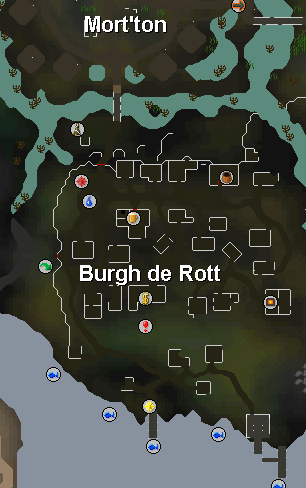 This could be just the place to set up operations to strike back against the evil of Lowerniel Vergidiyad Drakan and his vampyric overlordship in Morytania. And, who knows what other secrets about Morytania and its dark past will be revealed? Begin by speaking to Veliaf Hurtz in the Myreque hideout below the Hair of the Dog Inn in Canifis. 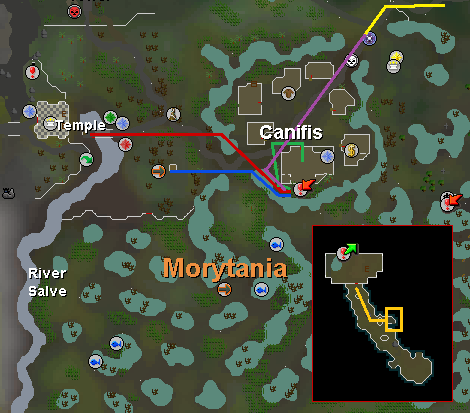 Red is the route from Varrock, Blue is the Fairy Ring teleport (code CKS), Yellow is the route after Ectofuntus teleport, Purple is the Canifis Lodestone teleport, Green is after Canifis teleport (Ancient Magicks). Go down the trapdoor behind Canifis pub, then push the Strange wall, walk a bit south-east and Squeeze-past stalagmite. To start the quest talk to Veliaf. Go through the whole conversation and he will tell you to find a new hide-out. This, he thinks, could be found at Burgh de Rott, a village south of Mort'ton. When you try to enter the town people will throw rotten tomatoes at you. Talk to them and you still will not be able to get in. Search a nearby table, then search the chest next to it. Place some food in the chest and that is your key into the town: They now seem to trust you. Talk to any of the Villagers and ask if there are any 'out of the way places'. They will tell you about a trapdoor you could enter in the pub. At the end of the conversation a bit becomes clear: You will need to help rebuild the town. 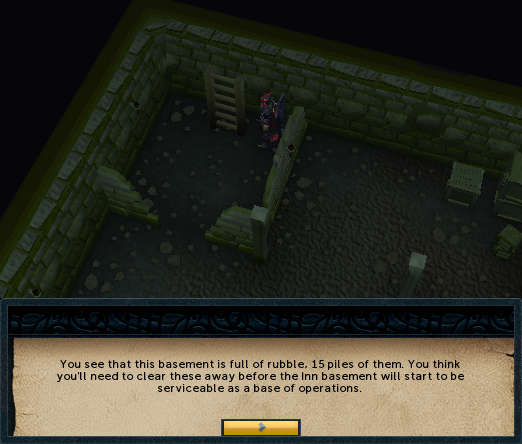 For the next part you need a pickaxe to clear the rubble on top of the trapdoor. In the pub climb over 'Broken down wall' and use your pickaxe on the pile of rubble. A bit west of the pub is a well with a bucket re-spawn next to it: Take a bucket before entering the basement. Now down the trapdoor and into the basement. Bring a spade. You now need to remove 15 piles of rubble. Be sure to have at least 6 free inventory spots to carry it. In all you will need 5 buckets or 5 trips to free the basement of its rubble. Use your pick-axe to 'mine rubble' (gives 30 exp per pile) then use your spade on rubble to fill the bucket and to pick up other 'rubble' consisting of various types of nails, broken glass and a rock. Do this with three piles of rubble, then fill your bucket with the rubble. Two items you will have found are a Dusty Scroll and a Plaster fragment. The cellar is now cleared. Go back up and talk to Razvan (or any villager) and you now will be asked to help with rebuilding the town. For the general store is needed: 6 planks and 24 nails the type of nail doesn't matter, use the ones you picked up cleaning the basement of the pub. Planks can be bought at Mort'ton if you have finished Shades of Mort'ton quest. Search the hole in the wall, then climb the ladder outside and search the hole in the roof. Use the planks on both the holes and go back in to talk to Aurel. He will now ask you to help stock the store. To do this you will need to collect some items for him. 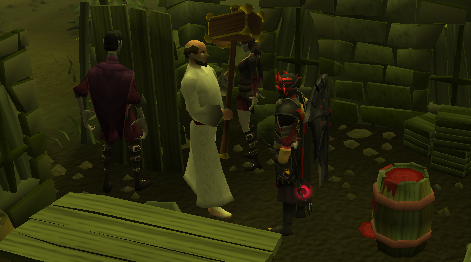 Everybody will need to collect 10 Bronze Axes and 3 Tinderboxes. You will also have to collect either 10 Mackerel or 10 Snails. You will also be given a Crate to store these items in to save some inventory spaces. Fill the Crate with the required items and take it back to Aurel. Next you are asked to help repair the bank. You will need 2 planks and 1 Swamp paste to repair it. Both can be bought at Builders store in Mort'ton. 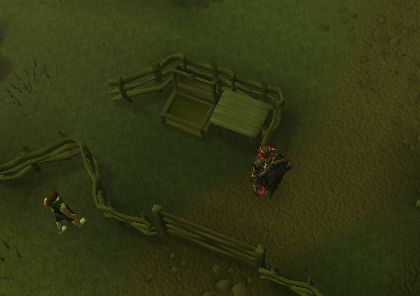 Use the plank with the bank booth and it is done. Talk to Cornelius and he will tell you to fix the wall. For this you will again need 3 planks and 18 nails (of any kind). Talk to Cornelius again and he will tell you you need to recruit someone, ask him if he is up for the job and he will say yes. You now have access to your bank. Talk to any of the villagers and they will tell you to fix the furnace. You will need two steel bars to repair the hole, one coal and a tinderbox to light it. Use the steel bar with the broken furnace and this will repair the hood. Search repaired furnace and you will find it is without fuel. Use one coal with it, and then use the tinderbox on the furnace. And you end up with more trouble ahead. 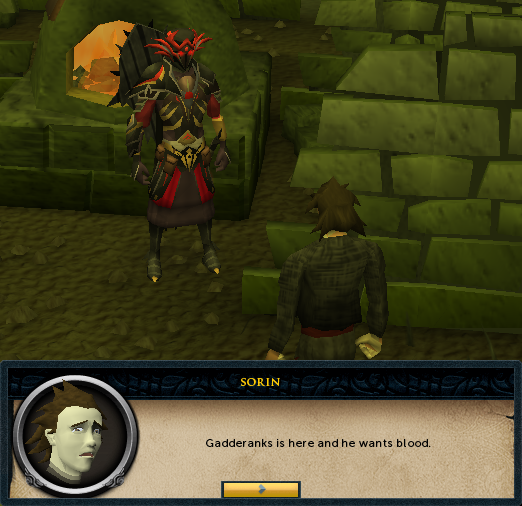 Gadderanks has turned up to collect blood from the town's people. Talk to Gadderanks who is at the General Store. He wants you to give blood. Talk to the others around and Gadderanks will speak to you. Attack him and he will be down but not dead. He will tell you his Vampire Juvinates will protect him. Now wield your Silver Sickle (b) and with Veliaf's help kill the Vampire Juvinates. Once they are dead talk to Gadderanks and he will tell you about a potion. He will also drop his Gadderhammer. Talk to Veliaf and he will tell you to meet him in the old hide-out in the Hollows. Head over there and talk to him again. Now talk to either Polmafi or Radigad and they will go to the new hide-out in Burg de Rott. Talk to Veliaf again and he will ask you to guide Ivan Strom to the Temple. Talk to Ivan and you will be given a choice of two routes. Route 1 is described as the hard route, leads through Canifis, and you will need to defeat two level 68 Vampire Juvinates. 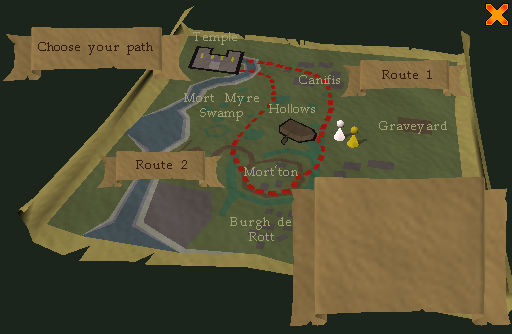 Route 2 is the longer route through Mort Myre Swamps and you will face four weaker Vampire Juvinates. Note: Before you go, you have the opportunity to equip Ivan with Steel Legs, Chainmail, a Steel Medium Helm and a Sickle. You can also give him up to 15 pieces of food (he only accepts Snails, Salmon, Slimey Eels or Stews). The best option is route 1. Wield your Silver Sickle (b) and prepare to be ambushed. You will need to protect Ivan Strom as he will flee back to the hide-out if he is down to half health. The trick is to use the surrounding so the Vampire Juvinate cannot reach Ivan when you fight them. Ivan will follow you anywhere you go and you have a bit of time to find the right spot. Should Ivan Strom flee you will need to return to the hide-out and try again. There is a way out that will teleport you near Canifis: an escape route at the south end of the 'room' you are in. The faster way to get back is to log out and log in again. Now head to Drezel and talk to him. 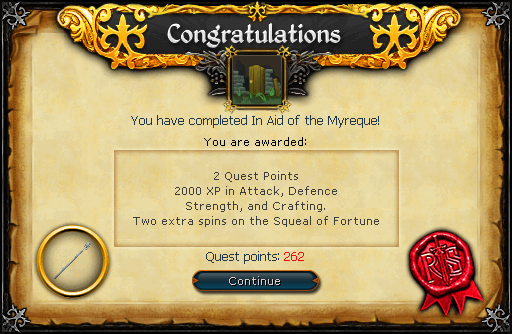 Either go through all the options or directly choose the option: "the people of Morytania rely on this" and he will give you a 'Temple library key'. Use this with the keyhole between the shelves on the eastern wall. A trapdoor will open and you go down into the library. Now search the bookcases and you will end up with three books in your inventory: an 'Ancient book' a 'Battered tome', and a 'Leather book'. Read all three and head back to the Hollows. A bit north of the entrance to the hide-out is a boarded up cave entrance. Use a hammer with the wooden board and enter the cave. Walk south then east and you will come to Ivandis Seergazes tomb. Use soft clay on it and you will end up with a mould. Now find a furnace with a Mithril bar, Silver bar and a cut Sapphire in your inventory. 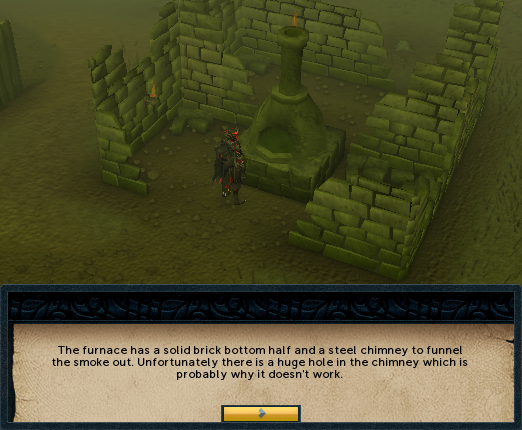 Use either the Mithril or Silver Bar on the furnace to make a 'Silvthrill rod'. Cast 'Enchant level 1 Jewelry' on it and head back to the Temple where Drezel is. Head through the gate past Drezel into a larger room. With a rope in your inventory, use the 'Silvthrill rod' with the well in the center of the room and you will get a 'Rod of Ivandis(10)' Head back to the hideout in the basement of the Burgh de Rott Pub and give the Rod to Veliaf. 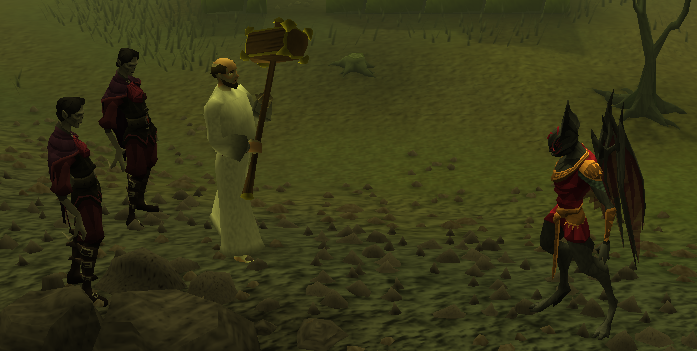 2,000 Attack experience 2,000 Defence experience 2,000 Strength experience 2,000 Crafting experience 2 spins on the Squeal of Fortune Ability to make Guthix Balance Potions and Rods of Ivandis You get to keep the Gadderhammer. The Gadderhammer is dropped by Gadderanks when you kill him. It's a two-handed weapon with speed like a longsword. If you lose it, you can buy it back from the general store in Burgh de Rott for 3,000 coins or buy from another player. Like explained in the guide, these can be smithed by using a silver bar with a furnance with a mithril bar and a cut sapphire in your inventory, before using the spell Level-1 enchant and attaching a rope to it, and finally using it on the well in the Paterdomus Dungeon. 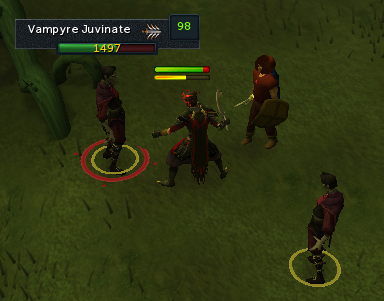 Its special attack can only be used on vampyres, and will freeze them in the air so you can use Guthix Balance Potion on it. For more information see the Vampyre Hunting Guide.